Still lifes involve painting or drawing a prearranged composition from various items that can be found around the home or even outside. My still lifes use house hold items; most of my pieces are drawn with soft and oil pastel on watercolor paper, but I also use gouache, watercolor, and acrylic paints. This piece was made with soft pastel and oil pastel. All works are framed with a standard picture frame. My style is realistic; however, I also deep hues of cool blues and warm splashes of yellows, oranges and reds. Not every still life is the same and they can be used as decoration for homes or businesses to give defining character and an air of sophistication. Dimensions for my still life pieces vary but do not exceed 24 in x 24 in. 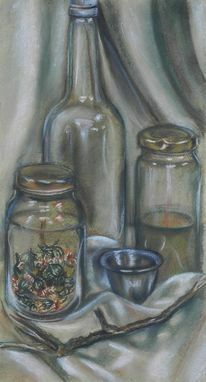 This still life, "Herbs" is approximately 10 in x 18 in.